Mpho Franklyn Parks Tau – Member of Johannesburg City Council (since 2016), President of UCLG (since 2016). Parks Tau also served as the mayor of Johannesburg, South Africa, during the period of 2011 – 2016. Moreover, he is a member of the African National Congress, and is the second democratically elected mayor, after Amos Masondo, of the Unified City of Johannesburg. Parks Tau has also the following public positions: - Co-president of Metropolis since 2014; - Member of the C40 Climate Change Network Steering Committee – since 2011; - Deputy Chair of the UN Special Advisory Committee on Safer Cities – since 2012; - Chairperson of the South African Cities Network - since 2012; - Chairperson of the South African Local Government Association in Gauteng – since 2011. Ilsur Metshin - Mayor of Kazan (since 2005), UCLG-Eurasia President (since 2006). Ilsur Metshin was born on April 24, 1969. He is a lawyer by education, has PhD in law. He has 18 years work experience in the position of Mayor. From 2005 up to the present time he is the Mayor of the city of Kazan. Under the leadership of Ilsur Metshin Kazan was twice awarded the title of “The Best Municipality of Russia” in 2007 and 2013. Ilsur Metshin has been holding tops in the “Best Mayors of Russia” ratings during the last ten years. From 2007 to 2011 he was Vice-President of the Organization of World Heritage. Ilsur Metshin made a significant contribution to the international municipal movement. 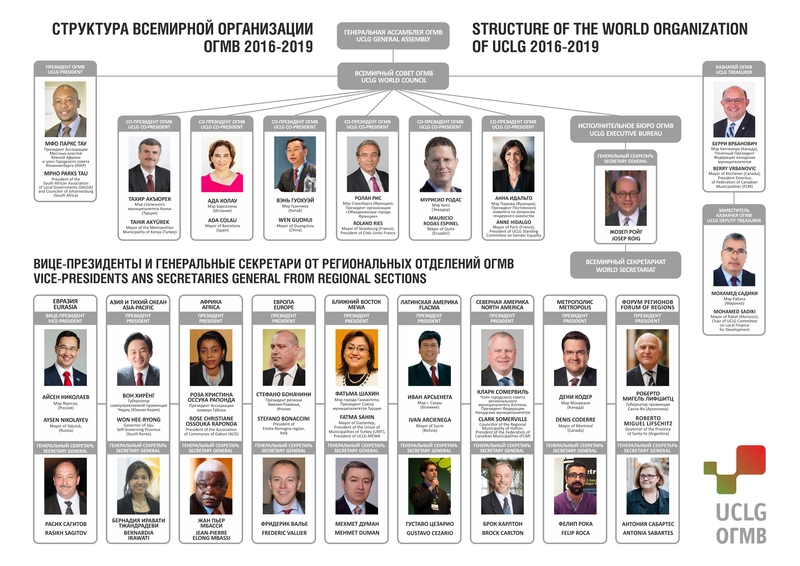 From 2006 to 2010 he was twice elected as Vice-President of the UCLG World Organization and President of the Eurasian Section of UCLG. An indicator of a high level of confidence of local and regional leaders of the world is the fact that Ilsur Metshin is the only Mayor who was elected UCLG Co-president for two consecutive terms from 2010 to 2016. - Member of the Congress of Local and Regional Authorities of the Council of Europe – since 2016. He is married and has four children. Hobbies: soccer, ice hockey and music. Aisen Nikolaev was born on January 22, 1972 in Leningrad. He became Minister of Finance of the Republic (Sakha Yakutia) in 2004. In 2007 he was appointed Head of the Presidential Administration and Government. He started work on the development of electronic government. In May 2011 he was appointed first Deputy Chairman of the government. Under his leadership, six state programs which laid the foundation for the development of industries of agriculture, tourism and entrepreneurship, environmental protection, science and innovation for years to come were developed. He was elected the Head of the Municipal District «the city of Yakutsk» on March 4, 2012. 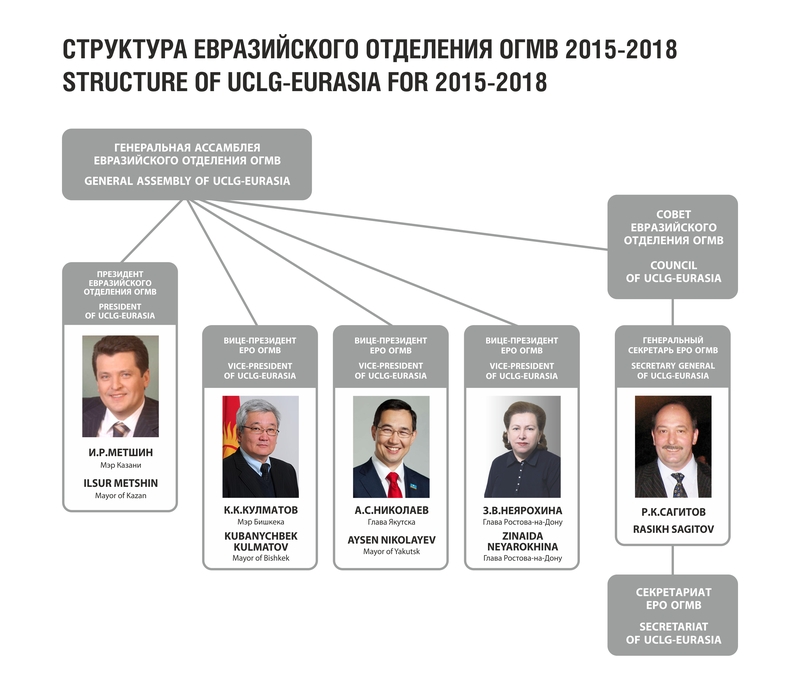 He was elected Vice-President of the Eurasian section of UCLG on July 6, 2012. In 2018 he was elected the Head of the Sakha (Yakutia) Republic. Alena Gubanova was born on 23 August, 1973. Since 1990 she had cooperated with the leading mass media of the Astrakhan region. After the graduation from the Rostov State University she was invited to worka at the Administration of the Astrakhan region. On 5 October, 2015, she was elected the Head of the Municipal District “The City of Astrakhan”. Sunduin Batbold was born on March 12, 1968. Since 1990, he has been an active public and political figure. In 2016, he was elected Mayor of the city of Ulaanbaatar. Emilia Sáiz studied European Studies and Law. She has a master’s degree in local governance in the information society. She has lead programmes dedicated to institutional capacity building, women empowerment and decentralized cooperation. She was elected Secretary General of UCLG at the World Congress in 2017 in the city of Hangzhou. Rasikh Sagitov was born on February 26, 1962. He has a linguistic education with a specialization in English, Arabic and French translation. His second university degree is in International currency and credit relations.